The introduction of uniform was a vital step in improving the order and efficiency of fighting units. Yet while many believe that it was Peter the Great who first brought uniforms to the Russian army, in fact the origins of standardized battle dress go back further. More than simply standardizing appearance, military uniform is essential to building discipline and forging bonds between comrades-in-arms. This was an unknown concept in the Middle Ages, when warriors wore whatever worked and knights projected their status through extravagant armor. Centuries on, the modern soldier wins victory not primarily through his individual traits but in tactical formation, bound by unified clothing and equipment. The first Russian military uniforms are often erroneously dated to the 18th century reforms of Peter I (the Great). While standard issue clothing for whole armies did indeed appear at the time, by then the way had already been paved by several precedents. Until the 16th century, the Russian army, like most European armies, had no single standard uniform. At its core were mounted militias formed under the nobility, with titled landowners receiving plots from the state and using revenues from their use to finance and arm their forces. These participated in military campaigns, usually under the principle of ‘mounted, armed and many’, with the lord riding on horseback, flanked by bristling droves of servants and vassals. The landowner could arm and equip his men as he saw fit, but there was little real uniformity in appearance, with colorful Russian caftan-style greatcoats being worn alongside leather Tatar jerkins and captured Polish armor. The fighting capabilities of such formations were limited, and it was in the mid-16th century that Ivan IV (the Terrible) took the crucial step of creating Russia's first regular armed forces. These were the streltsy (‘shooter’) regiments, which numbered around 3,000 men and were armed with the newly appeared musket. The units were stationed on the outskirts of Moscow, drew regular pay and were identified by the distinctive cut of their dress. It is still unclear what color the first outfits were, although accounts of the time refer to coats in red, yellow and blue. But by the end of the century some uniformity had been attained. 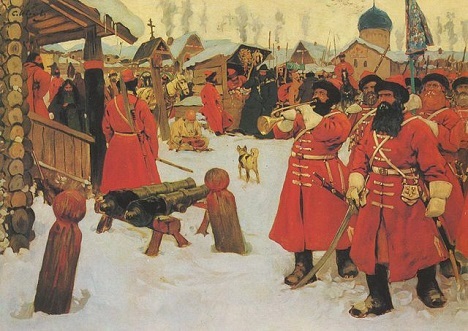 In 1606, a foreign observer described the Moscow streltsy foot soldiers as wearing “red woollen coats with a white sash across the chest.” Unified detachments of mounted archers also appeared around this time. A single musketeer uniform was developed in the early 17th century and remained largely unchanged until the reign of Peter the Great. Featuring a caftan with long tails, the uniform buttoned from right to left. The number of buttonholes differed according to the regiment, while officers’ buttonholes were sewn with silver or gold thread. Underneath was a padded jacket of the same color, while the cap was made of fur and was a valuable item in the case of officers, often bearing frontal insignia of gold emblems or ornamental plates. The color of the hats, boots and coat also depended on the regiment, while officers carried a lance with a decorative brush in different colors to denote rank. Another integral item worn by enlisted men was a white shoulder sash with spare powder charges and a bag of bullets. Overall, unified military clothing is regarded as first having been introduced by Oliver Cromwell during the English Civil War in 1645, only spreading to France and across the continent 30 years later. This contradicts the popular belief that French royal guardsmen wore the famous blue cloak with a cross during the era described by Alexander Dumas in his novel The Three Musketeers. In reality it was introduced 50 years later in the 1670s, when Charles de Batz-Castelmore d'Artagnan, the real-life inspiration for Dumas’ main protagonist, was already dead. But Cromwell cannot take all the credit: The Russian musketeer’s caftan is certainly among the earliest European military uniforms in Europe, if not the very first.